The official guide to SIMSOC, the dynamic group simulation game whose “potential for stimulating the learning process is staggering” (Teaching Sociology), in which players grapple with the challenge of governing society. In SIMSOC, players confront issues like abuse of power, justice, diversity, trust, and leadership as they negotiate their way through labor-management strife, political turmoil, and natural disasters. Success or failure is dependent upon decisions made by players and the creativity of the group—and every game is a teaching tool. To be successful, players must utilize every basic social process from cooperation and reward to threat and punishment. SIMSOC will make participants ask questions about social control, and bring everyday experience and deeper understanding to even the most arcane social and organizational theory. 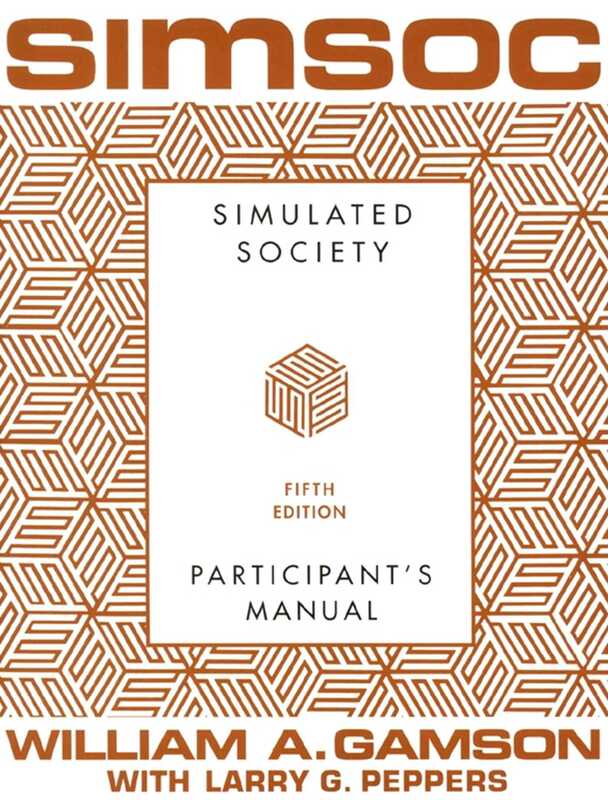 Included in this Fifth Edition of SIMSOC's Participant's Manual are instructions for playing, materials for play, study questions based on participation, and selected readings about simulation games, leadership, and social processes. New to the Fifth Edition are additional size levels to accommodate groups of up to ninety participants with simplified rules and readings by authors from Nicholas Lemann to Robert Putnam. You will shortly be participating as a citizen in a simulated society. If the society is to be a valuable learning experience, we will need your cooperation. Cooperation in this context means taking your objectives in the society seriously, We have tried to create a situation in which each of you has goals that depend on other people in the society for their achievement. Some of your goals will be held in common with other people, and some will bring you into conflict with others. Inevitably, some of you will do better than others in achieving your goals but, unlike some games, SIMSOC has no clear winners or losers. You represent only some of the citizens of your society. Other citizens are present only in imaginary form -- that is, certain rules of the game are based on assumptions about the reactions of these imaginary citizens. Nevertheless, this is basically your society to do with as you like. The coordinator's role is kept to an absolute minimum once the society is in process. He or she will maintain the bank, receive forms, and carry out other tasks specified in the manual to make the game operate. If questions about the rules arise, the coordinator will guide you to the appropriate section of the manual and help you locate appropriate forms, but will not interpret ambiguous rules or advise you how to deal with situations arising in the game. The coordinator will do everything possible to avoid becoming enmeshed as a participant in your society once it has begun. The rules in the manual are intended to represent certain "natural" forces in the real world rather than human laws. To ignore them by cheating simply renders the game pointless and meaningless. The coordinator should not be put in the position of having to monitor your observance of the rules, but should be able to depend on your cooperation to achieve the larger purpose of learning. The rules of the manual, as you will see, allow great leeway for you to add your own agreements and rules. The agreements that you make among yourselves are your own responsibility -- these represent human laws rather than "natural" forces. If a player ignores or refuses to comply with a rule your society makes, you must face the issue of how to deal with this behavior. All players have a responsibility to observe the rules in the manual to make the game operative, but it is a matter of individual choice whether one observes the rules that you may establish to govern yourselves. In spite of efforts to anticipate various contingencies, ambiguous situations will inevitably arise. When more than one meaning of a rule is possible, the coordinator will refer the question to a group within the society for interpretation. The coordinator will be concerned only with those aspects of the ambiguous situation that affect his or her specific tasks as coordinator. The rules that follow are detailed, but not as complicated as they first appear; you will discover this once SIMSOC is in process. A short summary of the rules is included here to give you a general sense of the nature of the society and the options available to you. It also includes page references so that later you can easily look up exact details as necessary. A careful reading of this summary is a helpful way to begin, but you should read the complete rules rapidly. Once you begin to play and attempt to achieve your goals, you will need to read various specific sections of the complete rules more carefully. Simbucks are the basic currency in SIMSOC. Initially, they are held in a bank run by the game coordinator. All members of the society live in one of four regions. A player may move to another region by paying a moving fee to the bank. A person cannot travel between regions without having either a travel ticket or a Private Transportation Certificate. Travel tickets may be obtained from a limited number of players who have travel agencies and receive a supply of tickets each session. A Private Transportation Certificate may be purchased from the bank. Every member of the society must, for every session attended, provide for his or her subsistence, doing this by means of either a subsistence ticket or luxury living. Subsistence tickets can be obtained from a limited number of players who have subsistence agencies and receive a supply of tickets each session. Luxury living may be purchased from the bank. Failure to provide subsistence for a session will mean loss of one's job. Failure to do so in two consecutive sessions means one is considered dead and cannot participate in the society in any way. The coordinator will maintain a Munchie Bazaar where Simbucks may be converted to food or beverages. Or, instead of Munchies, the coordinator may make other desirable items available for purchase with Simbucks. Participants can invest their Simbucks to buy risky enterprises from the coordinator. The success of these enterprises depends partly on luck and partly on the skill of the investors. There are eight basic groups in SIMSOC for which you can work. Only the heads of these groups will be designated by the coordinator at the beginning. The rest of the players must find jobs. The head of each group receives the group's income to dispense. The groups include two industries (BASIN and RETSIN), two political parties (POP and SOP), an employee interest group (EMPIN), a human services group (HUMSERVE), a mass media group (MASMED), and a rule-interpreting group (JUDCO). You should read the description of these groups before beginning play because you will be asked to designate a preference. If you are not picked as head of a group, you will be faced with the need for employment. You will also have an opportunity to support or withhold support from some of these groups. Numerical values for four National Indicators are calculated at the end of each session. The indicators are Food and Energy Supply (FES), Standard of Living (SL), Social Cohesion (SC), and Public Commitment (PC). These National Indicators may be raised by investing Simbucks in either of two broad public programs -- Research and Conservation, or Welfare Services. The National Indicators decline by a certain percentage each session and can be lowered further by various actions and events in the society. If the National Indicators decline below certain points, the income available to the basic groups in the society declines. If the National Indicators rise above a certain point, the income available to the basic groups in the society increases. If any National Indicator goes below zero, the society collapses and the game is over. Certain National Indicators (described above) are lowered when members are absent, regardless of the reason for the absence. Certain National Indicators are lowered if there are members of the society without jobs. Certain National Indicators are lowered if members die. The coordinator will announce whether this option is in effect. It provides for the designation of some members of the society as Minority Group Members. These people may be removed from their positions at any time by action of any two non-Minority Group Members, or may face other obstacles. You will be asked to select certain personal or individual goals to pursue during the course of the society. You will have an opportunity to change these goals and to declare at each session the extent to which you feel you are meeting them. Actual physical force is prohibited in SIMSOC but the equivalent of such physical force is provided. Any individual or group may create a Simforce with the power to arrest others and to protect specified others from arrest. A person who is arrested is restricted to his region and may not travel, may not hold any job or official position in the society, may not engage in any official transactions with the coordinator, and will have all possessions confiscated. All confiscated materials will be turned over to the head of the Simforce. A person is dead if his arrest is renewed for two consecutive sessions. More than one Simforce can be created, and it is also possible to remove an existing Simforce. Arrests lower certain National Indicators. Members of the society may riot by signing a riot form (Form M). Riots may be prevented, however, by the placing of a guard post. Riots lower certain National Indicators. There is no requirement that the society establish a government nor are there any formal rules regulating a government. The coordinator may announce the occurrence of certain "outside events" affecting the society, but you will not know in advance when the events will occur or what their nature will be. To achieve the individual goals you have set for yourself, to help the basic group to which you belong to achieve its goals, and to see to it that the society as a whole is a "success" -- however you may choose to define this. If you try to achieve these objectives, the larger objective of learning will be achieved (see Summary). 1. Taking resources from the bank or from other participants without their consent. 3. Counterfeiting Simbucks or other resources. 4. Forging another person's signature without his or her consent. William A. Gamson, the former President of the American Sociological Association, is also a former Guggenheim Fellow and Professor in Boston College's Sociology Department. He is the creator of SIMSOC and author of Talking Politics, The Strategy of Social Protest, and Power and Discontent, among other books.